Kiddo Charlie may be the only one in the photo who isn’t walking but everything he’s experiencing during this portion of his physical therapy treatment is teaching him how to walk in a more stabilized, upright position. 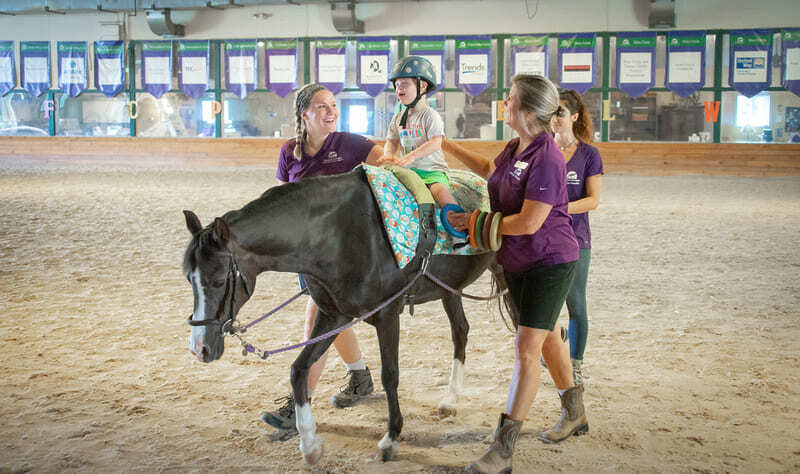 In addition to challenging Charlie’s balance and core strength, the three-dimensional movement of the horse is acting as a living template Charlie can learn from. And the ring activity Charlie’s about to engage in – reaching across his body to pass the rings from Miss Sue to his sidewalker and back again – mirrors the rotation and pelvic movement that accompany ambulation.